Computer steering wheel and pedals - the modern input devices, allowing you to feel full emotions in racing simulators. The wheel and pedals that are configured correctly, can not only give a lot of bright hours, but to help to learn to drive a car. Connect the wheel and pedals to the computer. Not always, these devices can be directly connected via USB - for computers with insufficient capacity, these input devices can become a heavy load. In this case, will cheap USB hubs, which can be purchased in most electronics stores. Immediately after connecting you must install the device driver. Most manufacturers are supplying their slot sets of CDs with all the necessary for correct functioning of rudder pedals. Although the wheel and pedals can be determined even without the original Windows drivers (like USB game device), only the presence of native drivers guarantee full compatibility and functionality of the gaming system. Calibrate the wheel and pedals. Calibration is fine tuning your system input, which is done empirically. The fact that all computers have different characteristics (power, sensitivity, processor speed), operating system versions, and choose values steering, power pressing, response speed is possible only empirically. Such operations do even test-pilots of Formula-1 race cars! To calibrate, open the "control Panel", select "Devices", then click "Game controller". Open the "USB steering wheel [manufacturer]". You can change the sensitivity by turning the wheel, pressing the pedals and picking up the desired parameters. You need to move the slider to change the sensitivity and speed of response. In the future, return to this settings panel for the selection of the desired values for each simulator. Download and install easy racing emulator. 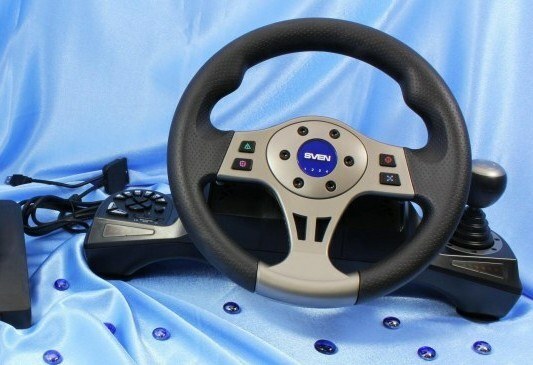 It is desirable to use for the development and configuration of steering wheel and pedals game with simple controls - so you will be able to find out what works, and learn to drive during the process. If you will try the forces in a challenging race, you can settle for less or lose faith in themselves. Optimal emulator to start can be any game from the series of Ford Racing, FlatOut. Test races in Need For Speed: World also suitable to check the settings of rudder pedals. Play race, rate the quality settings. Repeat the calibration in the case of inconvenience.